SONGSOPTOK: Do you think literature is really essential in our life? If so why? In your opinion, what is the true relationship between life and literature? What is your own experience? And how does this relationship relate to the general history of mankind? ANURADHA: Creative writing is a gift. It is classed among objects for entertainment. But we all know that the writer imparts humanitarian values through these artistic entertainments to a certain extent, that is, as much as the reader can absorb. SONGSOPTOK: We would like to know the beginning of the story, i.e. how your upbringing contributed to your own writing. Who were your favorite literary figures during the early period of your life? How they have paved your early routes in literature? ANURADHA: The list is endless as I am a voracious reader. And because, early on I figured out the difference between the so called bestseller and a classic, I read the latter. I strictly believe that only those works survive through the ages which address some universal themes so I tolerated the extensive descriptions of milieu and local beliefs and focused on the universally relevant theme of a work. I’ll give you an example: take the 1818 poem Ozymandias. Has it ever lost its universal relevance? My favourites were Hemingway and Albert Camus. But this declaration narrows down the range of literary influences on my writings. See, I write poems largely influenced by Browning and Eliot. I write short stories but no thrillers though what I used to read in my teenage days were all thrillers. And, name any writer, O Henry, Oscar Wilde, Ray Bradbury, Somerset Maugham, Saki, D H Lawrence, Chekhov, Tolstoy and Hemingway; I used to pick up one volume after another endlessly. Now I write novels – a thing that has come to me as a gift, suddenly – and I consider them long stories. However, two books have strongly influenced my worldview – The Name of The Rose by Umberto Eco and If on a winter’s night a traveler by Italo Calvino. These two books made me think that it is important for a creative writer to claim one’s authority as writer over and above all the 20th century literary theories that have mushroomed. And my novel One Word addresses this issue. SONGSOPTOK: Do you think that literature also bridges the human world with Mother Nature? As well as with the present time of our surroundings? ANURADHA: Nature is part and parcel of human experience. And a writer is always eco-friendly. A writer’s soul always harmonizes with Mother Nature. SONGSOPTOK: What are the main events that you think are the major issues that have influenced present day literature? ANURADHA: Present day literature is influenced by the experience of war and strife. I remember one of my students answered ‘save’ as an antonym for ‘attack’. I felt that the young generation is fully aware of the lives at stake. We usually teach the word ‘defend’ as the antonym of ‘attack’ assuming that the two contestants in a combat are equal in strength. But no. Today all helpless people are attacked. So the need for saving others comes uppermost in mind. SONGSOPTOK: Do you think in this age of information and technology the dimensions of literature have largely been extended beyond our preconceived ideas about literature in general? Now in this changing scenario we would like to know from your own life experiences as a poet, writer and a creative soul, how you respond to this present time. ANURADHA: I don’t have any preconceived ideas about literature in general. Creative writing undergoes continual changes in style and content. As social issues surface, these are addressed by the contemporary writers. As for its success compared to, say, films today, I think films can never beat the written word into extinction. I have written by the promptings of my heart. Why I am publishing my poems and stories, I am not sure if I know. But I do revise my write-ups to make them more communicative before sending them for publication. SONGSOPTOK: Now if we try to understand tradition and modernism in literature, do you think poetry can play a pivotal role relating the two? If so, how? What are your opinions about the role of the poet in bridging the gap, if any, between tradition and modernism? ANURADHA: Tradition too changes with time. What is tradition today was modern in the 20th century. Society is like a giant that takes slow steps progressively. Poetry in every language has incorporated the traditional styles and come up with the new in addition. I participated in two different poetry meets this year – one in Udaipur (Oct. 14-15) and one in Vijayawada (Nov. 13-14) – where poets read out ghazals in English. It’s fusion poetry, but look at its worth! A Maithili poem was written on the theme of woman’s empowerment. That’s ‘modern’ for Maithili. SONGSOPTOK: Do you think that society is the key factor in shaping you up as a writer. What about your own country? What is the influence of your country & your culture in your writing? Do you believe that all writers are by and large the product of their nationality? Is it an incentive or an obstacle for becoming a truly international writer? ANURADHA: The family is the smallest unit of society. My family did give me themes to express in poetry. Family, school, college, marriage and job, these are all unstructured influences. The country I am born in decides the medium of expression. I am a Bengali brought up in the Hindi belt, now living in Punjab. I prefer to express myself in English – in fact it was the medium of my entire academic career. However, a poet’s soul is always a world soul, one with nature and one with the totality of humanity. I have never felt my experience limited or my expressions stunted by my belonging to the country of my birth. Everyone has a place of birth to identify with and motherland is not exactly a poet’s only theme. SONGSOPTOK: Do you believe creative souls flourish more in turmoil than in peace? Why? Are you a protagonist of "art for art's sake"? Can you please present us with your point of view? ANURADHA: This is an interesting question. So far I did not disclose how my parents influenced me, but now I must admit, a measure of adversity is one of the keys to poetic expression. It’s as if a part of you is snubbed and vents out in poetry. If the same is on a wider scale, such as communal unrest or racial discrimination, the eruptions are relevant for a larger number of people and a writer’s work finds more publicity. I write according to the dictates of my heart, not prompted by social issues in general. But in the long run, when I read what I have published, I see a pattern. My writings reflect the 21st century in many ways. You can read The Cobra, for instance. I am a woman but I teach teenagers so I find myself expressing teenage passions more often, taking sides with a man as much as with a woman. Many of my poetic personae are just young males such as in the poems Pulse and Sometimes. There is a duet, Give me a Rose. SONGSOPTOK: Do you think people in general actually bother about literature in general? Do you think this consumerist world is turning the average man away from serious literature? And do you think poetry or literature can solve any problems in our everyday life? Why should we adhere to it? ANURADHA: Yes, people do read a lot. In fact, people have become more engaged with creative works because of the support of the media. Novels that have been adapted into films definitely find more readers. As for information and technology, people are busier; there is less leisure. But yes, people are busier – giving attention to all the demands, including reading. As I said, poets respond to the milieu as a volcano that erupts due to pressure. Poetry is an expression of human nature against uninvited suffering. Even a love poem is an expression of painful pleasure. So a creative writer is definitely doing a service to the society. But unlike a volcano that sweeps dead a section of civilization, works of art do not have such a drastic effect. Gradually, people get influenced. Otherwise, why do we have a list of writers from early 20th century India labeled as nationalists? SONGSOPTOK: Are you a feminist? Can literature play any decisive role in feminism at all? What role can literature play to make our lives better on a day to day basis? ANURADHA: This question makes me laugh. Ask male writers the same question. I write stories. I also express female sensuality as in Lofty and in the novel The Road Taken. I do describe relationships according to my own experience of the man-woman combination. But I am strictly against calling writers ‘feminist activists’ or ‘Dalit activists’ unless they do partake in propaganda of any kind. I believe that my books are 70% products of personal experiences of me and my fellows from the so far 40 years of my existence. The rest of the 30% is my projected future – the future of a woman indeed, living in a much more civilized world and living it wisely. SONGSOPTOK: Now if we want to look ahead, do you think that there is an oncoming crisis for literature in general? Will it bring new dimensions in our life ahead? Or do you think that the future of literature is not as bright as it should be? ANURADHA: No, there is nothing to suspect that creative writing will die out. It is an organic part of human life. 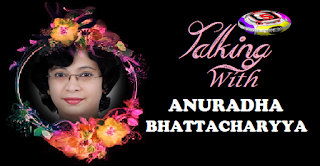 Dr. ANURADHA BHATTACHARYYA is author of 7 books, 3 of which are volumes of poetry and 2 are novels. Recently she has been honoured by Kafla Intercontinental, Chandigarh, INDIA with the title of SAHITYA SHREE in recognition of her contribution to serious literature. We sincerely thank you for your time and hope we shall have your continued support. Support :Visit our facebook page.